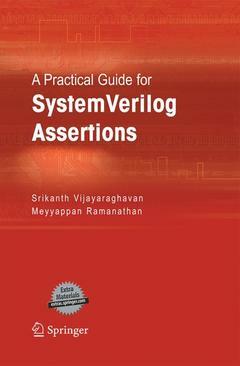 SystemVerilog language consists of three very specific areas of constructs, design, assertions and text bench. Assertions add a whole new dimension to the ASIC verification process. Assertions provide a better way to do verification proactively. Traditionally, engineers are used to writing Verilog test benches that help simulate their design. Verilog is a procedural language and is very limited in capabilities to handle the complex Asic's built today. SystemVerilog assertions (SVA) are a declarative and temporal language that provides excellent control over time and parallelism. This provides the designers a very strong tool to solve their verification problems. While the language is built solid, the thinking is very different from the user's perspective when compared to standard verilog language. The concept is still very new and there is not enough expertise in the field to adopt this methodology and be successful. While the language has been defined very well, there is no practical guide that shows how to use the language to solve real verification problems. This book will be the practical guide that will help people to understand this new methodology. Today's SoC complexity coupled with time-to-market and first-silicon success pressures make assertion based verification a requirement and this book points the way to effective use of assertions. Introduction to SVA.- Advanced ABV Methodology.- ABV for Finite State machines (FSM).- ABV for data intensive designs.- ABV for memories.- ABV for Simple serial applications.- ABV for complex bus protocols.- Index. There is only one book available in the market which was published in the first week of December 2004 which concentrates mainly on the language analysis and tool consumption of assertions, while this book concentrates on the basic language in the first two chapters and gets into pricatical examples of real ASIC designs. The book provides a library of pre-written checkers that any one can use out of the box. It also shows engineers how to verify different types of design blocks with assertions. In summary this book will be a practical guide for ABV methodology and not just a syntax primers.